Guidance to MSP authorities in seeking to cooperate with each other in MSP activities covering adjacent waters, including on communication, stakeholder engagement, data management and policy analysis. How can MSP authorities establish good working relationships for cooperating in adjacent waters? How can data be shared and managed across borders? How can effective communication between stakeholders in different jurisdictions be established? This guidance was developed by MSP authorities and other project partners working together in two pilot project areas in the Atlantic sea basin (Ireland - Northern Ireland (UK), and Portugal – Spain). It is the result of careful cooperation in data collection and management, stakeholder engagement and analysis of governance frameworks in the two transboundary contexts. Although the project was not a statutory process and did not lead to a maritime spatial plan, official bodies were centrally involved and commonly agreed to the Good Practice Guide. It presents the outputs of a process of common working in the two pilot areas and in the project region as a whole over a period of 18 months. Two pilot areas were selected, via a process of deliberation between the authorities involved. They then decided on the extent of within the area and the key issues to be considered. Data was then gathered on both sides of the border of each area, and carefully analysed, manipulated as necessary, and entered into a geo-database, so that GIS outputs could be produced covering the transboundary areas in question. In parallel, stakeholder engagement exercises were conducted, to allow cross-border discussion of the key issues of concern to representatives of different sectoral and governmental interests, and a governance and policy analysis was conducted to investigate the extent to which regulatory instruments and policy priorities aligned or differed either side of the border in the two areas. Throughout the exercise, careful attention was paid to collaborative working, including finding the best means of communication, sharing tasks equitably and seeking to understand concerns. 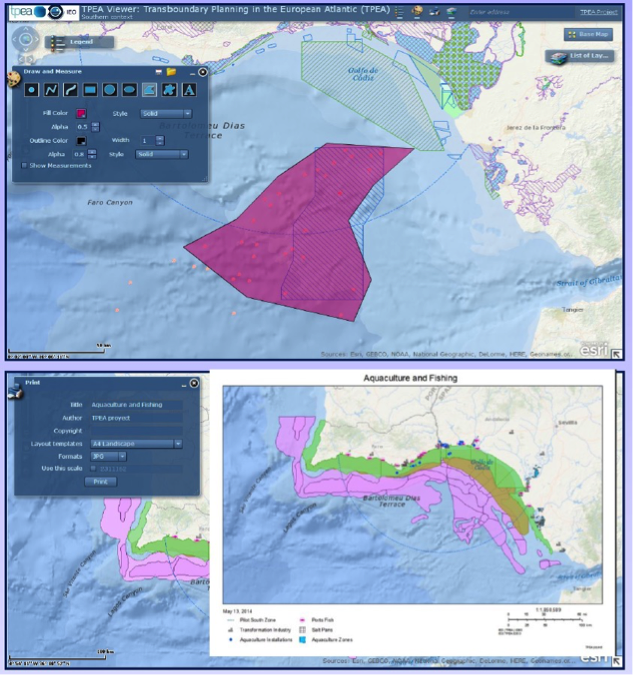 Reports providing data and other information on the two pilot study areas; web-based portal providing visualisation of data in the two areas and an interactive GIS representation of the southern area; a guide to evaluation of MSP processes; and a Good Practice Guide summarising the principles of transboundary cooperation developed during the project. The project was carried out in the context of the roll-out of MSP across Europe and aimed to provide guidance to other MSP authorities involved in transboundary cooperation. The project outputs provide tangible evidence to show that cooperation can be constructive and productive, such as in relation to data sharing and representation. The evaluation report and good practice guidance are directly transferable to other regions.